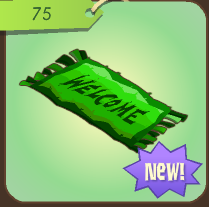 i got a green welcome mat today and it turned white!!!!!!!!!!!!! I'd love a Top 10 post about annoying stuff AJHQ has done/does. Wait, maybe make that a Top 100 post. Haha I know right! But seriously, I think the old Welcome mat looked better, added a rustic feel to it. Why do they have to change perfectly good stuff! You could do a Top 10 post about the most over rated items. Interesting I never knew that! Thanks Mel! I came during the time of the green mats. I remember them changing and I was like "what the heck? I want my old mat back!" Cause I think they changed the ones in your inventory too. I think top....... Will be great! It wasn't boring at all. As soon as I saw the title, I knew that yeti thingy would be in there xD! Yes yes YES! I love the "top..." posts! I never thought about this Welcome Mat business, and I do see the difference between the old and new one, cool! do more top 10 lists!